The I/Q Modulation Generator R&S®AMIQ and the Simulation Software R&S®WinIQSIM™ open up new dimensions for the generation of I/Q signals. The I/Q Modulation Generator R&S®AMIQ and the Simulation Software R&S®WinIQSIM™ open up new dimensions for the generation of I/Q signals. 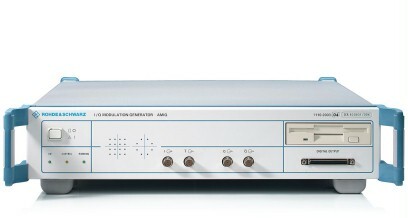 The R&S®AMIQ is a dual-channel modulation generator that has consequently been designed for use as an I/Q source. It is programmed and set with the Software R&S®WinIQSIM™. The R&S®AMIQ outputs I/Q baseband signals or even can generate an IF signal (up to 25 MHz). In combination with the Vector Signal Generator R&S®SMV03 the I/Q baseband signal can be upconverted to the RF. Each channel can store 16 000 000 samples. Even at high symbol rates sequences of sufficient length can thus be generated. With clock frequencies of up to 100 Msample/s and a high amplitude resolution of 14 bits (16 bits resolution with digital output, option R&S®AMIQ-B3), R&S®AMIQ is the ideal source for any signal in the world of digital modulation. An automatic amplitude/offset alignment as well as fine adjustment of the skew provide excellent symmetry of the two channels which previously was extremely difficult to attain with dual-channel ARB generators. The error vector can thus be minimised. A typical application of R&S®AMIQ and R&S®WinIQSIM™ is not only to drive the I/Q inputs of a vector signal generator but also for baseband applications, e.g. for testing I/Q modulators/demodulators.